The Weyr Kingdoms were split in two when the King’s wife died. In his mourning, he felt such anger that he decided to keep his taweyr (fighting/death magic) and cast away Neweyr (life magic). Centuries later, the consequences are still very much present and only man can wield taweyr and woman neweyr. The unlucky ones born with the wrong magic, the Ekhono, are hunted down in the Kingdom of Rurik and forced to flee to Weirland. The princess of each kingdom thrives for something different and will do their very best to change their world, despite what little power they have. The Rose Throne caught my interest while browsing netgalley because I’m such a fan of fantasy and I must confess, I’m still unsure if I liked this novel or not. There are elements I liked, others I disliked and even after thinking about it for a day after I finished reading, the juror is still out on that final decision. I guess I’m neutral? One of the things I liked most about Mette Ivie Harrison’s book is the rich Lore she blessed us with. I loved the original magic she created and how it was handled by the characters. It created interesting tension between the characters and I appreciated that each Kingdoms had their own point of view on the matter. Further more, the fact that the Princess of Weirland (Issa) came to Rurik made things much more interesting as their culture clashed. On the other hand, I had issued with the plot and pace. We follow both Princesses and their betrothed along their journey, for nearly a year and to my dismay, there wasn’t much action. They are executions, but it’s a common event in the Kingdom of Rurik and didn’t bring much heart-pounding energy. My main bother though, is the fact that there isn’t a clear goal during the whole journey. Yes, there is a desire to fulfill a prophecy, but every characters is so busy fulfilling their duties that it takes the passion out of it all. I wasn’t bored through the novel, don’t get me wrong, but I never felt an urgency nor a finish line to look forward to, so it was a disappointment to me. Thankfully, the individual character’s redeemed the previous issue in some ways. I liked that each of them had very unique personalities and each of them reacted in their own way when faced with the King in particular. Princess Issa is sweet and innocent and I loved her for it. She finds herself surrounded by wolves and is none the less determined to marry the young Prince Edik to save her own Kingdom. Her strong sense of duty could be dull but she was very endearing. Princess Ailsbet comes out as very austere because she keeps everyone out, but she loves her bother very much and I liked that she was willing to help Issa. Their unlikely relationship pleased me! The young Edik was frustrating because he wanted so much to please his father that he was waking a fool of himself, on more than one occasion I felt this urge to shake some sense into him, but in the end, I simply pitied the poor kid. Lord Kellin, Ailsbet’s betrothed, turned out to be one of my favourite characters. I honestly couldn’t pin point the reason why, but I felt a connection to him. He is mysterious and play the part on the King’s most trusted man, all the while doing what’s best for his country, whether that King agrees or not (not that He would know). The one thing I didn’t like, character wise, is the relationship between Issa and Kellin. They can’t stand each other as they meet, ignore each other, and at some point, without anything happening, they are madly in love. It was some unbelievable that I was completely baffled. I thought I might have missed a chapter or something. 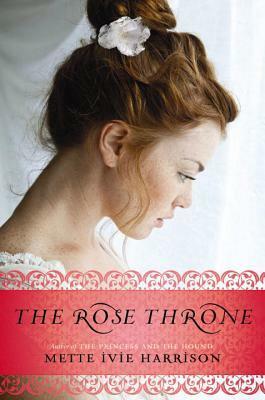 I’m also on the fence regarding the conclusion of The Rose Throne, mostly because a lot happens at once, which felt very anti-climatic compared to the rest of the novel and because miss Harrison made some very cleaving decisions. Not every character will live to tell the tale, and I was surprised at the way some characters dealt with the events. I can’t say much more without spoiling the conclusion to you, but in the end, I don’t know if I will read the second book in the series. I liked the lore and the characters, and if you enjoy Mette Ivie Harrison’s writing style I’m sure you love enjoy this novel. Too bad it didn’t quite work for me in the end. I've read Harrison's YA fantasy before, and I have to say it's either hit or miss for me. Sometimes I GET it, and I love her writing, and others I'm mystified and disappointed. I hope this one will be a 'love' for me. And you should try another of her books to see if you like it any better - you may!